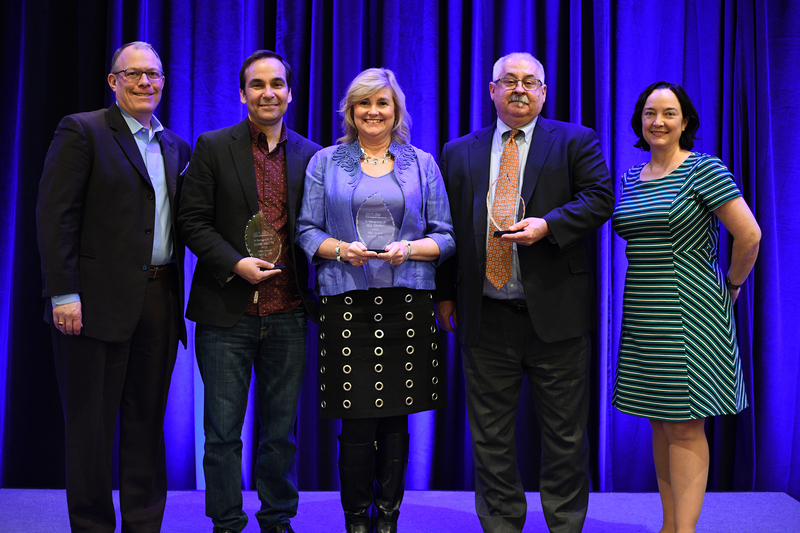 ATLIS Pillar Award Winners Jamie Britto of Collegiate School (VA), Jill Brown of Albuquerque Academy (NM), and Curt Lieneck of the University of Chicago Laboratory Schools (IL) are flanked by ATLIS Board President Jason Ramsden and ATLIS Executive Director Sarah Hanawald. The organizing concept for this year’s ATLIS Annual Conference led to myriad conversations and connections for the more than 490 attendees who gathered in Crystal City, Virginia. With over 100 informative concurrent sessions, insightful keynotes, and our first ever awards ceremony, attendees learned, laughed, and grew together for four event-packed days. If you haven’t completed our post-conference survey yet, please take a moment to do so. Speakers: Please complete this survey. Attendees: Please complete this survey. We launched quite a bit at the Annual Conference -- in the hotel pool (underwater robotics), into the air (drone obstacle courses), and for our community. During the member breakfast and in the general sessions, I was able to share new ATLIS launches, including our iKeepSafe Student Data Privacy Certification and to the ATLIS EdTech Resource Center. One of our most important launches was the awards luncheon. I was honored to introduce the ATLIS Pillar Awards to the community for the first time. Our three honorees, Jamie Britto (Collegiate School, VA), Jill Brown (Albuquerque Academy, NM), and Curt Lieneck (University of Chicago Laboratory Schools, IL) model the kinds of leadership called for in Monday’s keynote by Donna Orem, NAIS President. Orem charged our attendees during her Monday keynote to serve their schools not just as technologists, but as thought leaders. “When technology changes exponentially, but schools change logarithmically, it's crucial to be very deliberate about which technological changes you embrace, in what priority," Orem noted. Technology has become a strategic rather than strictly operational force in schools. This shift means that having an effective working relationship among heads of school and technology leaders becomes essential, a topic addressed in the keynote follow-up with Orem, ATLIS Board President Jason Ramsden, and a panel of independent school heads and technology leaders. ATLIS is proud to offer tools and resources that help independent school technology leaders to do just that. We offer our members tools such as the Technology Impact and Efficacy (TIE) Assessment, which leverages smart analytics to help improve teaching and learning in member schools. This past year, we released guidelines for self-study in the area of technology, something that our members told us was missing from their toolbelt. When we develop new resources, our mission is always at the forefront.This means that we assemble communities of practice from across the independent school and technology communities. We’d love to have you join us--whether it as a reviewer, a volunteer mentor, or a developer of new resources. On the first Wednesday of every month, we offer a Member Benefits Meeting. Please join us to learn more about what your ATLIS membership offers. You can access our Calendar of Events here. Comments on "Launched! ATLIS Annual Conference Highlights"